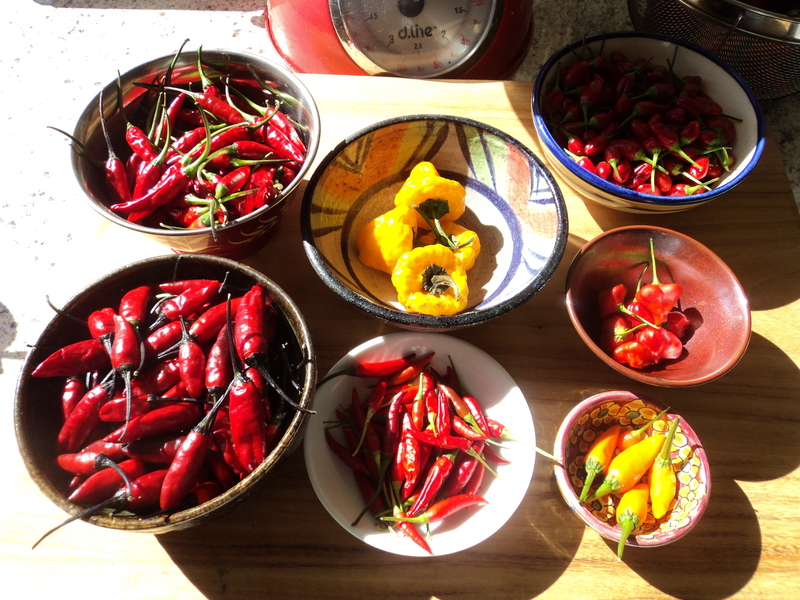 Here are some things I now know about chilli. No matter how careful you are, wearing gloves, holding the chili by the stem, etc you will always get chilli on your fingers. That chilli will hurt when you wipe eyes, sweat on upper lips, not to mention sensitive parts when going to the toilet. If you forget end end up with stinging eye lids or lips, rub a little cooking oil the affected part. A chilli product is like Goldilock’s porridge. For some it will be too hot, for others it will be too mild and some some it will be just right. Fresh chilli, roasted chilli and ground chilli powder all have a different heat and flavour. If your food isn’t hot enough add freshly chopped chilli before eating. If your curry is too hot for your taste – add potato or sweet potato and cook a little longer till the bland vegetable takes up some of that heat. Serve curries with a selection of side dishes – some to cool the heat, some to increase it. Then every one is catered for. If your chutney is too hot for your taste. serve with cheese or meat to balance the flavour. Tags: chilli, chutney, tips. Bookmark the permalink. Previous post ← Relish, Chutney, Pickle – What’s in a Name?